A mother and calf are relaxing in the sun between bouts of grazing on grass and heather. 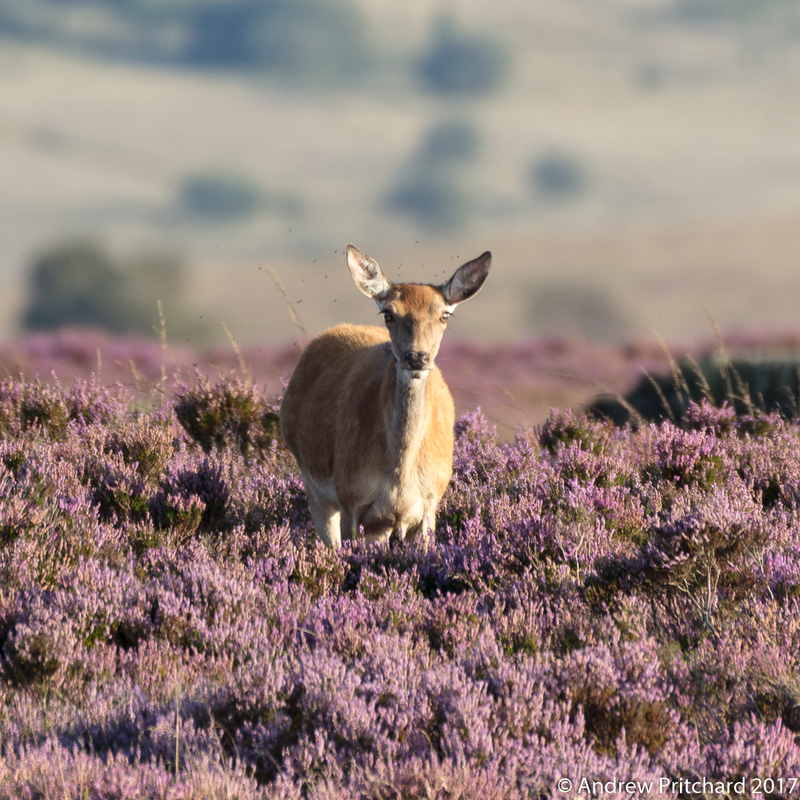 In the background the purple flowers of the heather form an out of focus hint of colour. 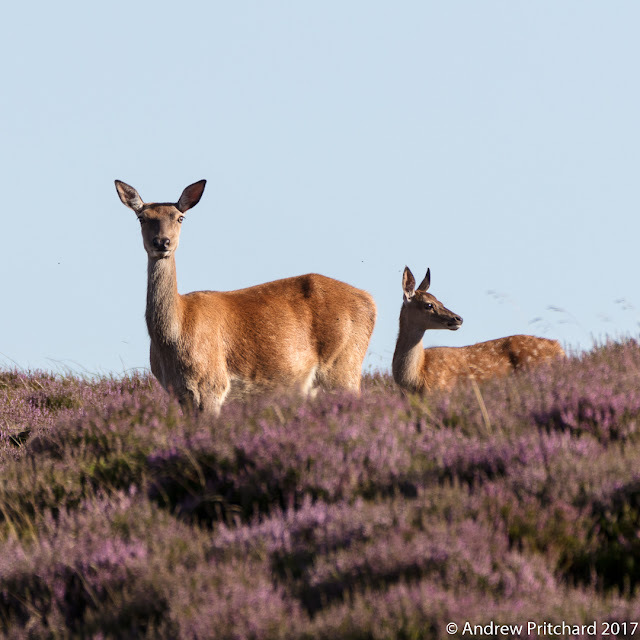 Heather is in bloom throughout August, starting slowly but turning the moorlands an intense purple in the second half of the month. 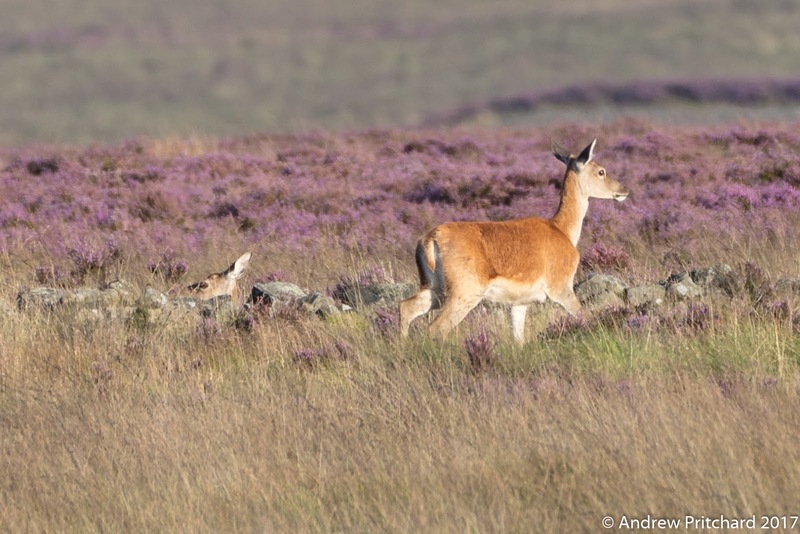 The purple heather forms a carpet beneath this hind and calf as they feed and walk slowly across the moor. The calf still has visible white spots on it's flank. It is between two and three months old, so has grown well but not lost it's birth camouflage markings yet. A calf and hind in the long grass. A small calf and hind are travelling through the long grass, with the calf almost hidden. Only it's neck and head show above the grass. If you look carefully you can see some small black flies in a cloud around the hinds head. Together with the purple heather, increased fly activity on the moors seems to be a feature of August! A larger calf and smaller calf flank a hind in the long grass. Two calves and a hind in the moorland grass, walking to join the rest of the herd. The moorland grass is still looking straw coloured during August. It won't be long until this begins to turn a lot more Autumnal in colour, which together with the seed pods on the heather, and the dying bracken begins to turn the moor a rich brown. A yearling or brocket with single tine antlers. A yearling or brocket with single tine antlers stands in the tall grass staring towards the camera. Although the antlers are still covered in velvet, they will soon lose that covering and become small spikes, characteristic of yearling male antlers. 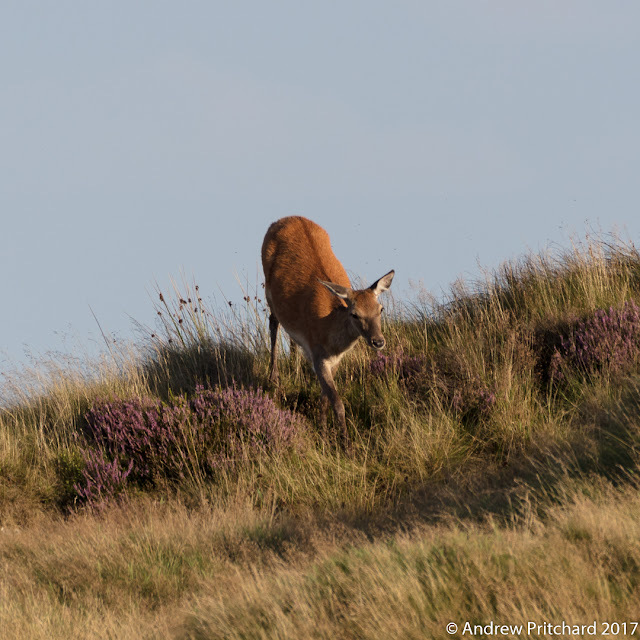 Young stag in silhouette on the heather covered moor. Young stag in stands in silhouette against a cloudy but bright sky on the heather covered moor. The heather forms a brown and purple carpet through which the deer walk. They seems to mostly choose to eat the grasses on the moor at this time of year, as can be seen sticking out of this young stags mouth. Four stags with growing antlers walking across the moor. 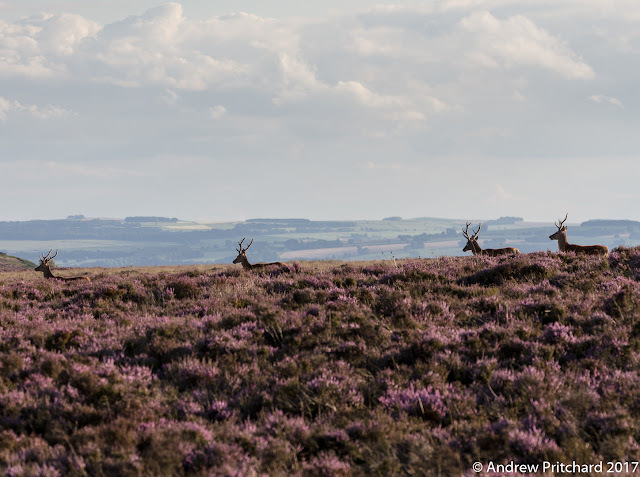 Four stags with growing antlers are walking across the heather moorland. Some fields and woodlands can be seen in the distance, at a lower altitude than the moorland areas. The moorlands were used extensively in the Bronze Age when the climate was better than it is now, but it appears they were not recolonized in the Medieval Warm Period as many Bronze Age archaeological sites still exist on the moors. Chewing grass and peering across the moor. 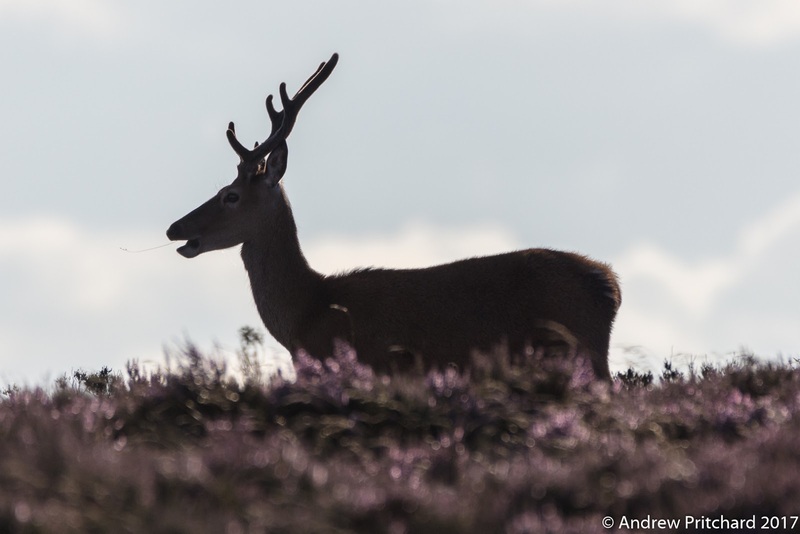 A stag is chewing grass and peering across the moor. His interest is directed at something to his right, causing him to momentarily stop chewing the grass which can be seen poking out of his mouth. The heather is producing nectar whilst in flower, which can be smelt across the moor - a very honey-like aroma while the heather is in bloom. The deer seem to prefer grass to eat though, perhaps turning to heather more once the grasses have died down during winter. Heading across the grassy moor to a stand of bracken. Two hinds and a calf are heading across the grassy moor to a stand of bracken. 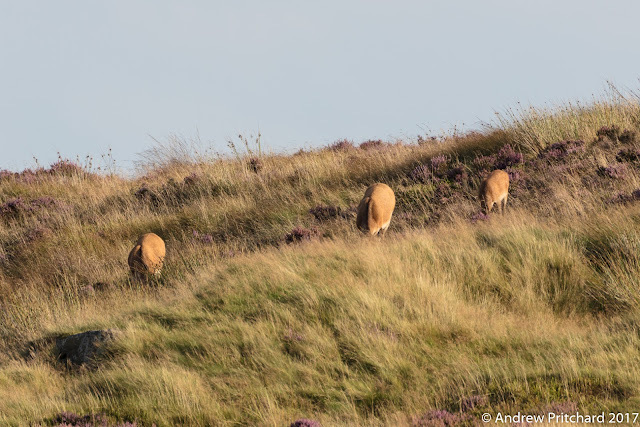 One of the hinds appears be looking in the direction of the stags whilst they are marching in line across the moor. It may be these other deer that holds the stags interest. 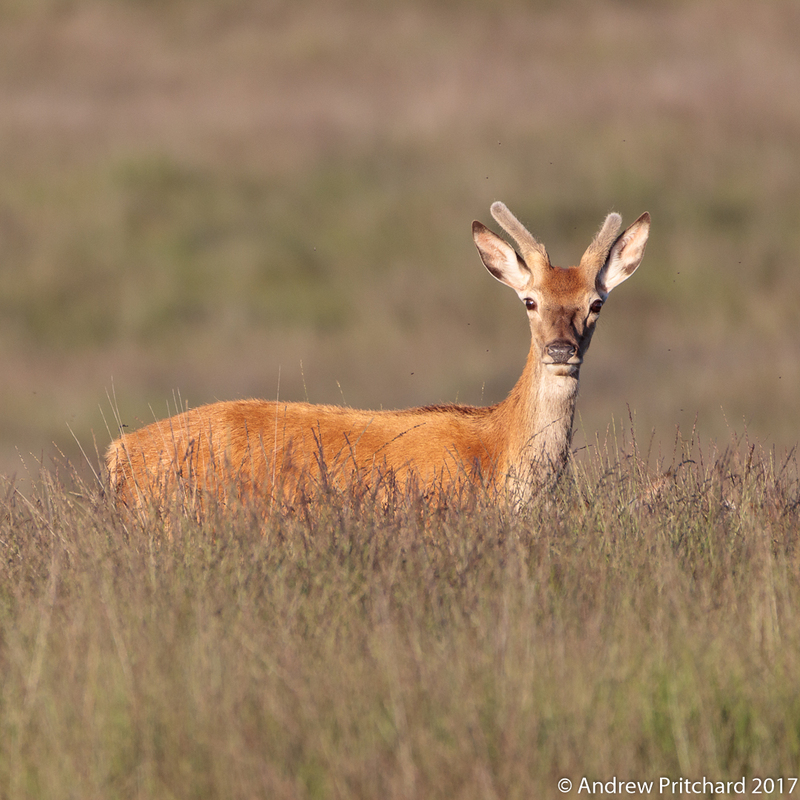 Although it is too early for the beginning of the rut, which won't begin until mid September, perhaps the male and female deer are beginning to take more notice of each other! Two stags with velvet covered antlers staring at something to their right. 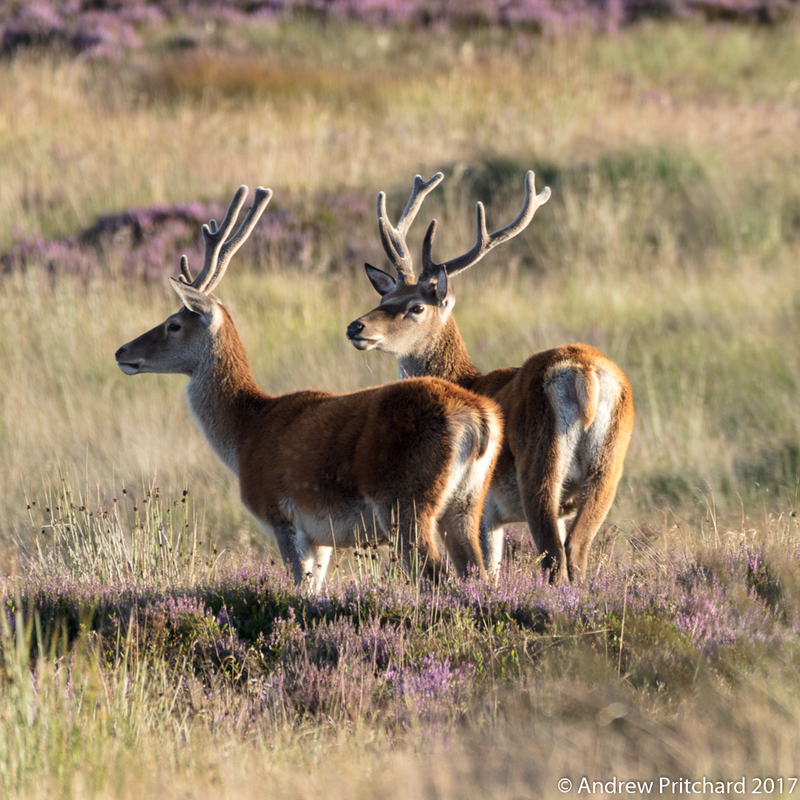 Two stags with velvet covered antlers are also staring at something to their right, which is most likely the hinds and calves who are walking through the grass some distance away. 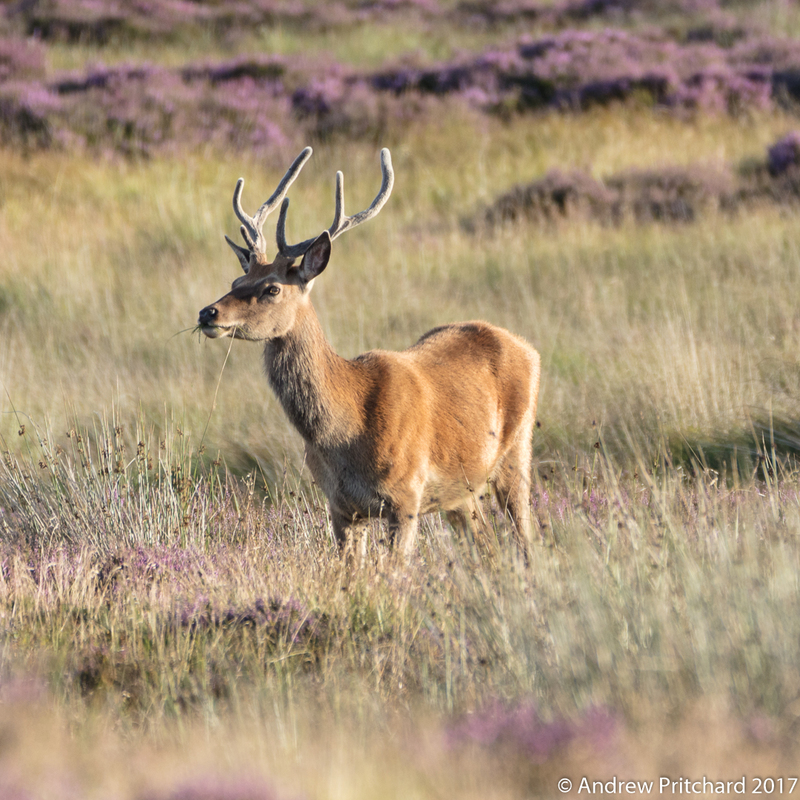 The stags' antlers are not ready for the rut just yet however. 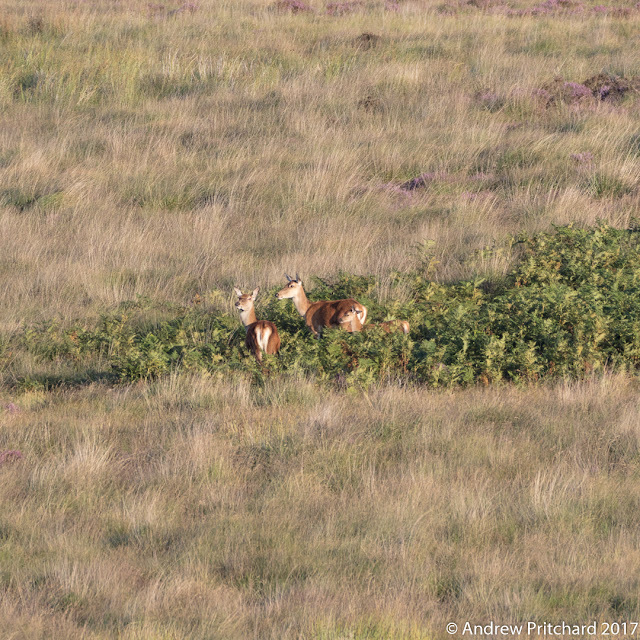 The two hinds and calf have made it safely across the grassy moorland to the stand of bracken. Once in the bracken, they seem to feel safer, and stop to regroup. 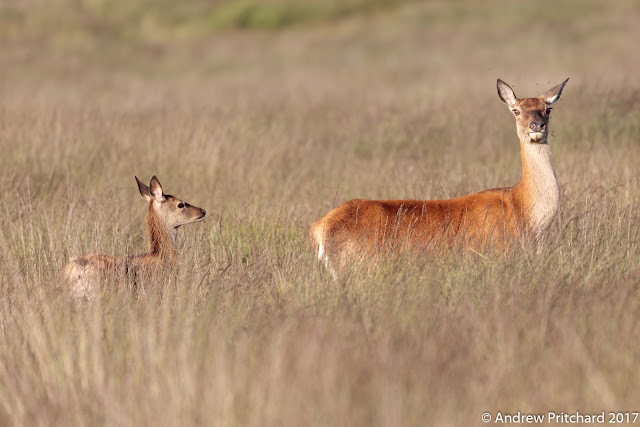 They are looking at the rest of their group of hinds and calves who have not crossed the open grass moorland yet. 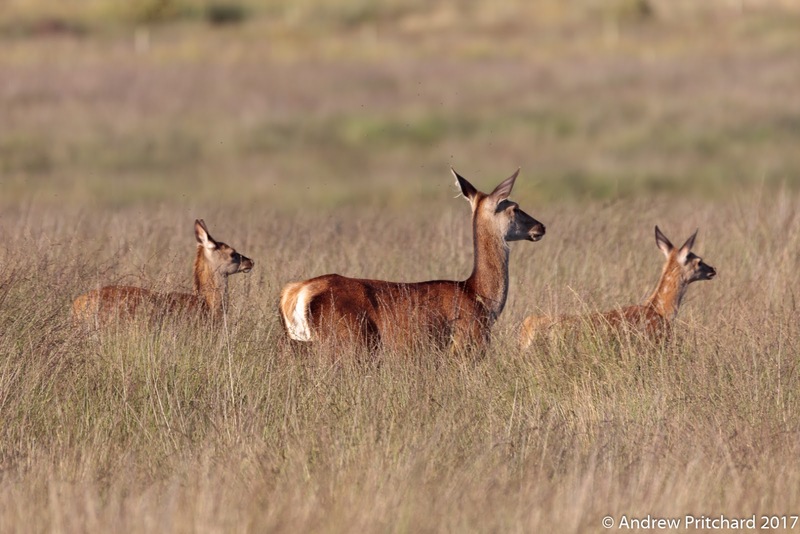 Three deer with heads down eating grass, in an area of disturbed ground. This was probably caused by some early quarrying. This area is some distance from the gritstone edges in the area, and it was often the case that small quarries were used to supply stone for boundaries and walls. The deer seem to like this place, perhaps because it can provide shelter from wind and rain. Walking down a steep slope to join the others. A hind is walking down a steep slope through grass and heather to join the others. The steepness of the ground is evident in her angled body position as she walks carefully into a small hollow. The deer will often graze and the ruminate in areas like this, and can be quite hard to spot whilst lying down. Often all that can see of them is the tops of their heads and ears poking up. A hind walking past another who is lying down behind an old dry stone wall. A hind walking past another who is lying down behind an old dry stone wall. Only her ears and the top of her head are visible whilst she lies in comfort behind the tumble down stones. This wall seems to have had no upkeep for a long time. It leads down to an old boundary stone on the moor, which has been used as a boundary marker for many hundreds of years. Surrounded by a cloud of flies. 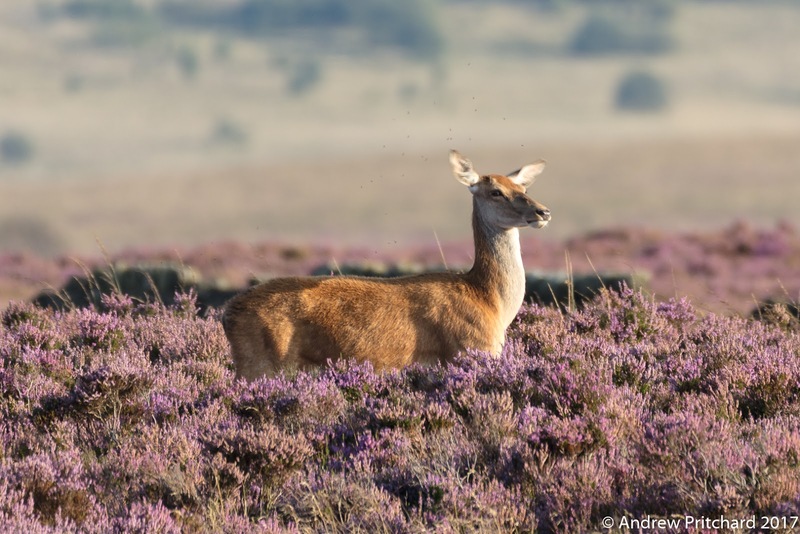 A hind standing in purple heather is surrounded by a cloud of flies. It is perhaps a disadvantage to be a large herbivore living on moors that can act as a water trap, holding a lot of dampness throughout the year. This may be more true now, as the moors are no longer required to supply water to a nearby reservoir, and have been altered in recent years to reduce drainage. This may be great for bird life that feeds on insects, but is perhaps annoying for the deer. Ear waggling disturbs the flies. A hind uses ear waggling to disturb the flies buzzing around her head. This is the only tool at this hinds disposal to be rid of the annoying pests! 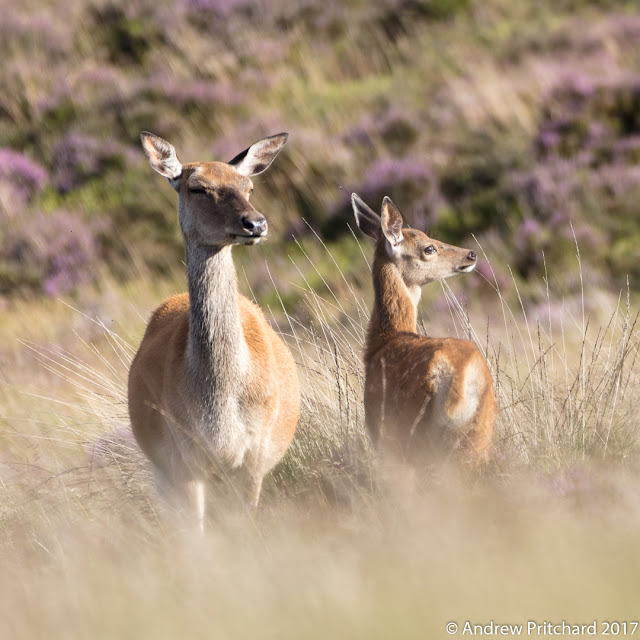 It can be even worse for stags, who as we saw last month can attract larger clouds of the small insects which appear to be attracted to the dying velvet that up to now has helped to grow some large antlers.